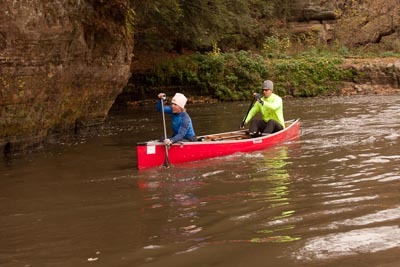 Paddle 7 miles down the winding Kickapoo River along rock out-croppings and through diverse vegetation. The river route begins at Bridge 7 and ends at Bridge 14, the Transition Area. Road Bike 15 miles through the hilly driftless area. The route takes you through the valleys and over the ridge, in one of Wisconsin’s most scenic rural landscapes. Steep climbs and rapid descents provide the ride of a lifetime! All cyclists must observe Wisconsin traffic laws. Helmets required. Drafting prohibited. Trail Run 3 miles in the Kickapoo Valley Reserve. The course consists of winding and wooded trail and Old Highway 131 Multi-Use Trail, which is a deteriorating road bed. The Transition Area is located on County P near Bridge 14 in the Kickapoo Valley Reserve. Parking for the race is here. A shuttle takes paddlers to the Bridge 7 start. The bike and run legs begin and end at the Transition Area. Check-in, refreshments, awards all happen here!